The Court of Ceremonies is a trail in the Fremont Indian State Park in Sevier County, Utah. The interpretive trail leads up a narrow canyon behind the Visitor Center. 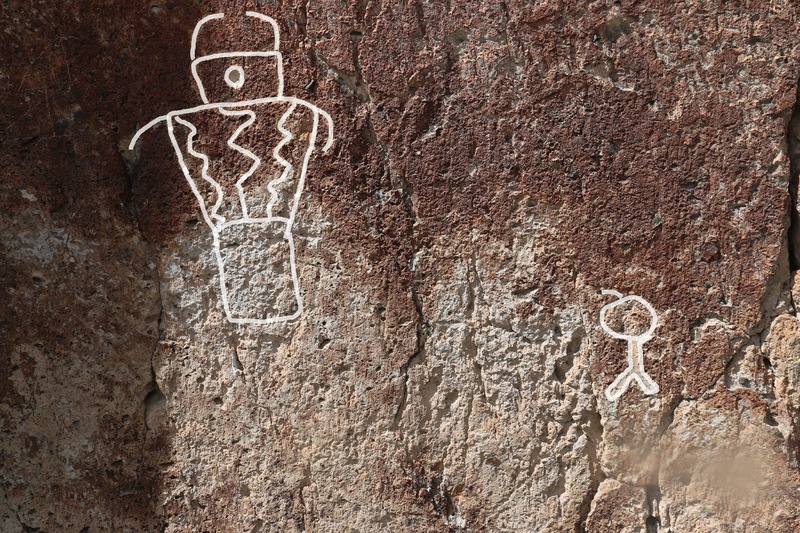 According to the Paiutes the canyon was used for initiations. 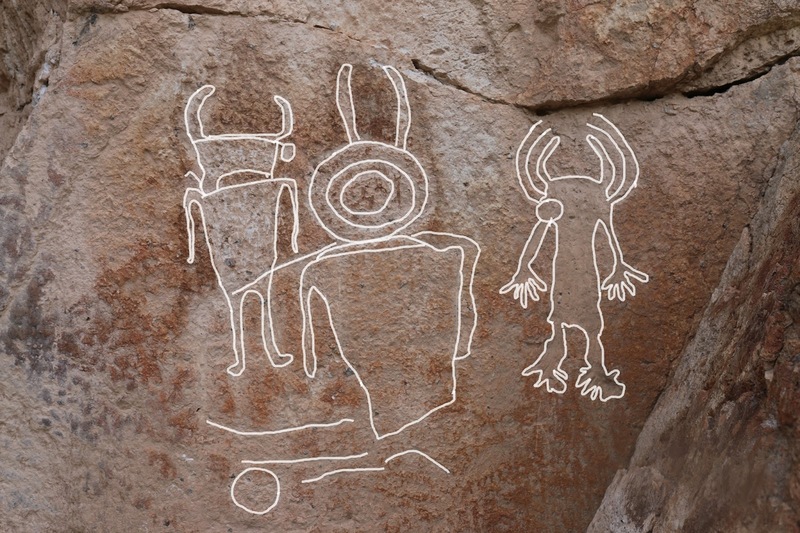 Different rock art panels along the trail were used in the process of instructing initiatives about manhood. The trail is a bit primitive with some loose rock and a couple of moderately steep sections. 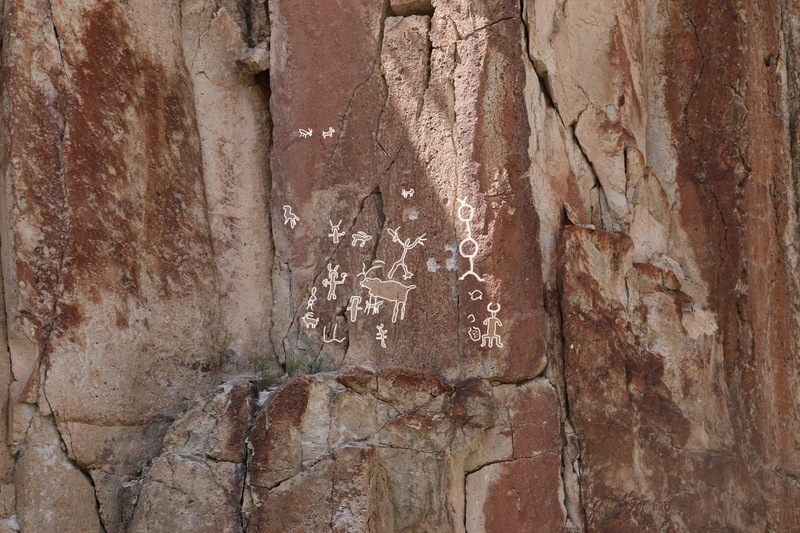 The Court of Ceremonies trail begins near marker #9 of the Parade of Rock Art trail behind the Visitor Center. Be sure and pick up a trail guide at the Visitor Center before setting out on the trail. They have laminated copies that you can borrow or you can print out your own copy from their website and bring it with you. 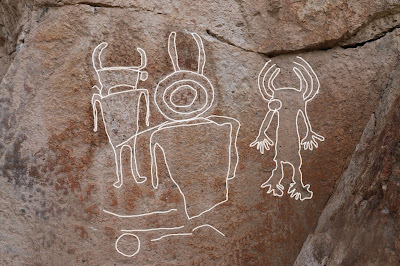 A large panel of petroglyphs can be found on the western wall as you enter the mouth of the canyon. The trail guide provides a lengthy interpretation of the panel that would have served as the initiatives starting point. A hunting scene can be spotted on the opposite cliff. Stone steps have been places to aid in the climb over the rock pile to get into the upper section of the canyon. At the top of the climb the trail levels off and crosses into the Fishlake National Forest. At that point the trail becomes an easy path once again. The legless figures in this photo, that appear to float in the air, are thought to signify either gods, medicine men or priests. Here is another panel that is among the few that the guide had nothing to say about. Say hello to the cyclops. The solitary hole in the face is actually a bullet hole made by some vandal and not part of the original image. After passing a junction with the Spirit Canyon trail the Court of Ceremonies climbs out of the canyon to the ridge where it comes to another intersection, this time with the Hidden Secrets trail. From here the trail descends the ridges hogback as it loops back toward the Visitor Center. At the bottom of the ridge is a pithouse where visitors that care to are allowed to climb down the ladder and enter the subterranean chamber. The last stop along the trail is a granary that visitors can make a close inspection of. 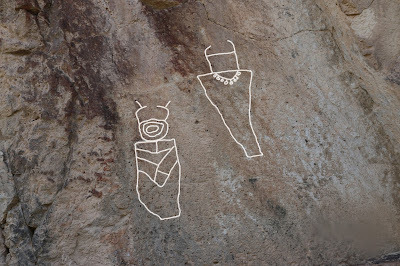 The Court of Ceremonies is an interesting trail where a variety of things can be learned about the mysterious Fremont culture. 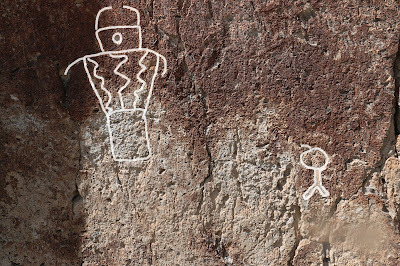 Much of the information appears to have come from the Paiutes of southern Utah that were gracious enough to share from the knowledge that has been passed down to them from their ancestors. That is something that is sorely missing from most of the ancient sites that we visit. If you would like to see it for yourself then all you have to do is 'Take a hike'.